Next time your little sweetie asks you for a treat, satisfy their candy cravings with Pink FUN. This vanilla and tonka scented bubbler delivers a cheerful childhood blast from the past. The sugary scent will remind you of your favorite childhood treats. Resist the urge to take a bite of this bright roll, despite how tasty it may smell. Instead, we recommend you mold this one into a pair of portly pigs or a collection of pretty bon bons, then crumble under running water for mounds of creamy candy bubbles. Simply delicious! Price $6.95 for 8.8 oz. This is like play dough made into soap! We purchased it as part of one of the Christmas gift boxes from Lush. We shop there because it smells yummy and all the products are natural. My children loved FUN…the smell, the texture and the ability to use it as soap. 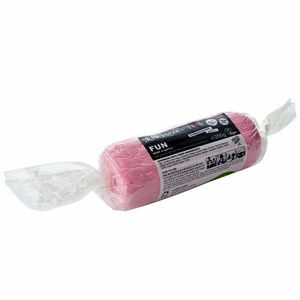 Pink is sweetly scented and comes in a plastic wrapped roll. It says it can also be used as shampoo, but we didn’t have much luck with that. It gets stuck in clumps and doesn’t lather. I also wish the packaging was a bit different, because once you get the inside ingredients wet, it will disintegrate and ruin the FUN. Overall, we loved this for kiddo bath time.